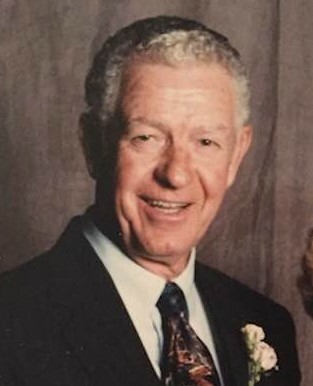 Obituary for Marvin Conrad Watkins | Herald & Stewart Home-Funerals, Inc.
Marvin Conrad Watkins, husband of Charlene Deitering Watkins, of Jeffersonville, passed away Monday, September 10, 2018. He was a 90 year old native of Gaston, North Carolina, son of the late Minyard Edward and Letha Janie McCarter Watkins, a farmer and member of Hope First Church of God. In addition to his wife, he is survived by 2 daughters, Rochelle (Scott) Mathes and Lisa (Hank) Bergsieker, both of Michigan, and 3 grandchildren, Lauren Kuzniar, Austin and Jessica Mathes. He was preceded in death by a daughter, Stacey Yocum, 3 sisters and 4 brothers. His funeral will be 11:00 Wednesday at Hope First Church of God with burial in Fortune Cemetery. Visitation is 5-8:00 Tuesday at the church. Arrangements are entrusted to Herald & Stewart Home for Funerals. Contributions are suggested to the American Cancer Society or the church of ones choice.